1 of 6 Heat oven to 350 degrees F. Coat oval 10-cup baking dish with nonstick cooking spray. 2 of 6 In large deep pot of lightly salted boiling water, cook rigatoni until al dente, firm but tender, following package directions. Drain. 3 of 6 Meanwhile, in large, heavy-bottomed saucepan, heat oil over medium-high heat. Add onion; cook until softened, 5 to 7 minutes. Stir in flour; cook 1 minute. Gradually whisk in milk. Bring to boiling, stirring continuously; boil until thickened, about 1 minute. Remove from heat. 4 of 6 Set aside 1 cup cheese for topping the casserole. Stir the remaining 2 cups of cheese, the hot-pepper sauce and salt into milk mixture until smooth. 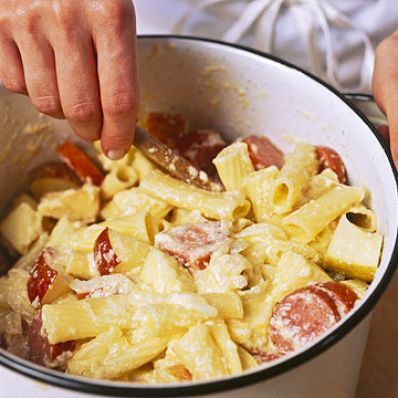 5 of 6 In pasta cooking pot, toss together pasta, cheese sauce, kielbasa and apples. Spoon into prepared baking dish, mounding slightly. Cover. 6 of 6 Bake in 350 degree oven, covered, for 30 minutes. Uncover. Stir rigatoni mixture. Sprinkle top with reserved cheese and the scallions. Bake until cheese is melted, about 10 minutes. Let stand 10 minutes before serving. Makes 8 servings. Per Serving: 4 g fiber, 577 mg sodium, 56 g carb., 20 g Fat, total, 54 mg chol., 11 g sat. fat, 485 kcal cal., 20 g pro.